‘Graphic Design: Now in Production’ was a group exhibition on the subject of graphic design, curated by Andrew Blauvelt and Ellen Lupton. The exhibition started at the Walker Art Center (October 22, 2011 – January 22, 2012), then travelled to NY’s Governors Island (hosted by Cooper-Hewitt, May 26 – September 3, 2012), onwards to the Hammer Museum in LA (September 30, 2012 – January 6, 2013), and then to the Grand Rapids Art Museum (February 1 – April 28, 2013). As we’re writing this, the exhibition is scheduled to travel to three more places: the Contemporary Arts Museum in Houston (July 20 – September 29, 2013), the Southeastern Center for Contemporary Art in Winston-Salem (October 18, 2013 – February 23, 2014) and Rhode Island School of Design (RISD, March 28 – August 10, 2014). More about the exhibition as a whole can be read here. 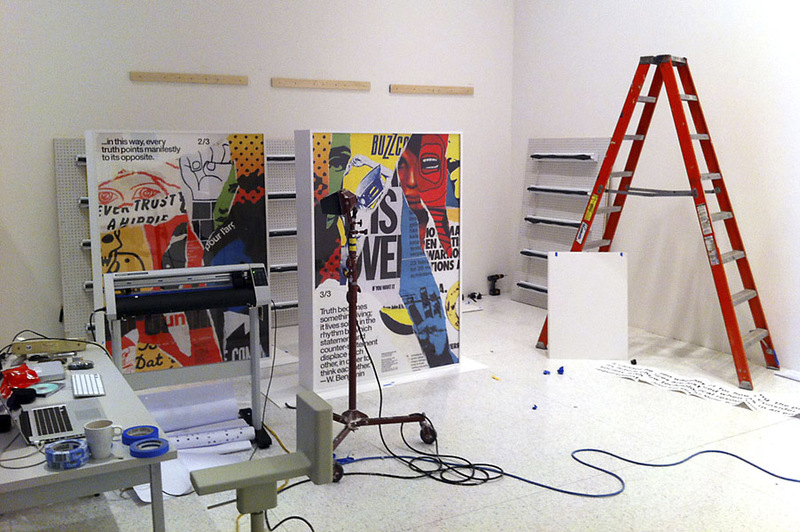 For the exhibition, Andrew Blauvelt commissioned us to design a series of three posters. He didn’t ask us for posters announcing the exhibition; rather, he asked us to design a set of posters that would be an integral part of the exhibition. Furthermore, the plan was that these posters would be shown in bus-shelters located around the venue. In other words, these bus-shelters would function as a sort of ‘satellite’ vitrines, circling around the exhibition, but still very much a part of it. In fact, we worked on a very similar project before, in November 2004, when we designed a series of three posters for the group exhibition Terminal 5 (for that exhibition, we were also commissioned to create bus-shelter posters; again not to announce the exhibition, but as an integral part of the exhibition). Let us explain the concept. As one of the themes, you mentioned “the culture of making”… which immediately made us think about “the culture of unmaking”, or better said, the relationship between creation and destruction (creation as destruction, destruction as creation). We have always been huge admirers of the work of the French ‘affichistes’ (like Jacques Villeglé, Francois Dufrene, Raymond Hains, and the Italian Mimmo Rotella), artists who made collages (or more accurately, décollages) using torn posters. To us, these layered collages perfectly encapsulate the whole idea of the ‘paper memory’, of graphic archeology. These torn fragments offer an almost psycho-analytical portrait of graphic design – as if the artists are digging through different layers of consciousness. Moreover, by focusing on the material quality of paper, they showed graphic design as what it is – a physical, human-made construction. They really pierced through the sphere of images, to reveal the material base. 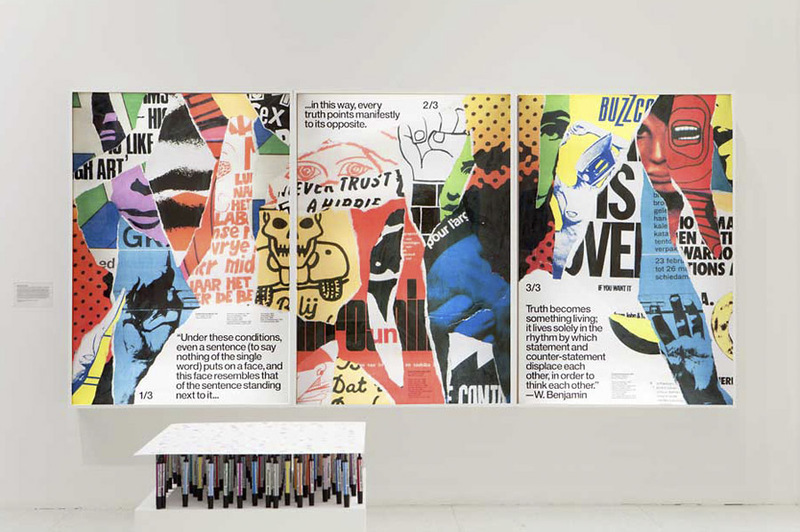 These layers of posters also refer to another idea we’re really interested in: the idea of printed matter as an actual environment, as an integral part of the city. In other words, we’ve always wanted to explore this notion, of ‘affichism’, a bit further – and your exhibition was a perfect occasion to finally dig into this subject. What we did was this: we tried to recreate these ‘affichist’ décollages, using fragments of graphic languages that have influenced us. The late-modernist voice of people such as Crouwel (the visual landscape in which we were raised), the post-punk culture of the ’80s (in which we grew up as teens), the early-modernist influences (which we came across through the practice of graphic design), and the counter-culture of the ’60s (which we find extremely inspirational). By juxtaposing all these different (often conflicting) graphic languages, we hoped to come to a sort of psychological portrait of our own graphic sensibilities, while at the same time addressing some of your main themes (the culture of making, design labor and production, etc.). We then added a quote by Walter Benjamin, taken from ‘The Arcades Project’. Ever since we came across it, it’s a quote that means a lot to us, as it provides us with a very useful model of how graphic design can be interpreted: as a landscape of conflicting voices, in which truth becomes something living. When we use this quote (in interviews, for example), we often suggest that Benjamin’s words refer to the ‘flaneur’, walking through the 19th-century cityscape of Paris, being confronted with a multitude of affiches, billboards, signs, slogans, street names, sandwich men, newspaper kiosks, etc. And since this quote comes from ‘The Arcades Project’, this interpretation seems very plausible indeed. (However, we have to admit that it is a bit of a lie. In reality, Benjamin describes the effect of hashish on reading. But we often neglect to mention this – which is also a way to “keep truth a living thing”, so to speak. Nevertheless, in combination with the torn posters, we think the quote refers really well to the whole idea of ‘affiche culture’, the idea that every poster is part of an ongoing ‘dialogue’ between posters. In that sense, it’s a less cynical, more modernist, and more optimistic version of Susan Sontag’s phrase “one part sentimentality, one part irony and one part detachment” (which is, roughly, how Sontag describes ‘affiche culture’ in her essay ‘Posters: Advertisement, Art, Political Artifact, Commodity’, in 1970). Also, the use of a Benjamin quote ties in quite well with some of the other themes of the exhibition (the designer as producer, means of production, etc. ), as Benjamin wrote extensively about the relationship between aesthetics and production. So Benjamin feels natural within the context of this exhibition. What we also like about this set of posters is the fact that it almost becomes a ‘mini-exhibition’ in itself. After all, the three posters feature a specific collection of posters, curated by us. True, only torn, unrecognizable fragments are shown, but still: it’s an exhibition model. A sort of subjective and fragmentary history of modern graphic design, compressed to three posters, like a sort of miniature archive. Anyway. We think you get the idea. We hope you like these posters. We think they will fit perfectly in the show. Let us know what you think of it! Special thanks to Andrew Blauvelt and Emmet Byrne.